In climate policy, substitutions metrics are used to determine exchange ratios for different greenhouse gases as part of a multi-gas strategy. The suitability of the metric depends on the policy goals and considerations regarding its practical use. Here, we present a multi-model comparison study to look at the impact of different metrics on the mitigation strategies and global climate policy costs. 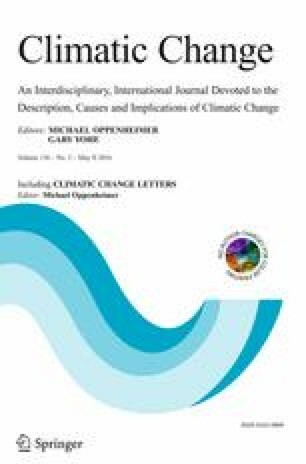 The study looks into different Global Warming Potentials (GWP) and the Global Temperature change Potential (GTP). The study shows that for all the models, varying between GWPs - from different IPCC reports, with different integration periods: 20 or 100 years - has a relatively small influence on policy costs (< 2.2 % spread across scenarios with a 2.8 W/m2 target) and climate outcomes. Metrics with a constant low substitution value for methane (effectively reducing its abatement), in contrast, lead to higher-cost mitigation pathways (with an average cost increase of 32.8 % in a 2.8 W/m2 scenario). If implemented efficiently, a time-varying GTP leads to a limited cost reduction compared to GWP. However, under imperfect foresight in combination with inertia of CH4 abatement options, or if implemented sub-optimally, time-varying GTP can result in higher costs than a 100-year GWP. At the same time, given a long-term radiative forcing target, a time-varying GTP results in slightly higher maximum global temperature change rates. The online version of this article (doi: 10.1007/s10584-016-1603-7) contains supplementary material, which is available to authorized users.